Alford Homes Awarded "Top 40 Custom Home Blog" in the United States. D Home Magazine selects the best area homebuilders in their annual builder publication. 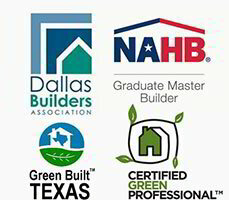 These awards are based on votes from ballots sent to every builder who is a member of the The Dallas Builder's Association. Approximately 650 ballots are distributed annually. Alford Homes named "ON Top Builder" 2017. The Dallas Builder's Association in 2007 awarded Alford Homes Gold and Silver Awards in the categories including: Custom Builder of the Year - Runner Up, Best Outdoor Living Space, Best Master Bathroom, Best Kitchen, Best Interior, Entry/Foyer, Best Builder Website, and Employee of the Year. Alford Homes wins 2015 and 2016 ARC Awards. "Best Builder" Award (380 Collin County Area) 2016.